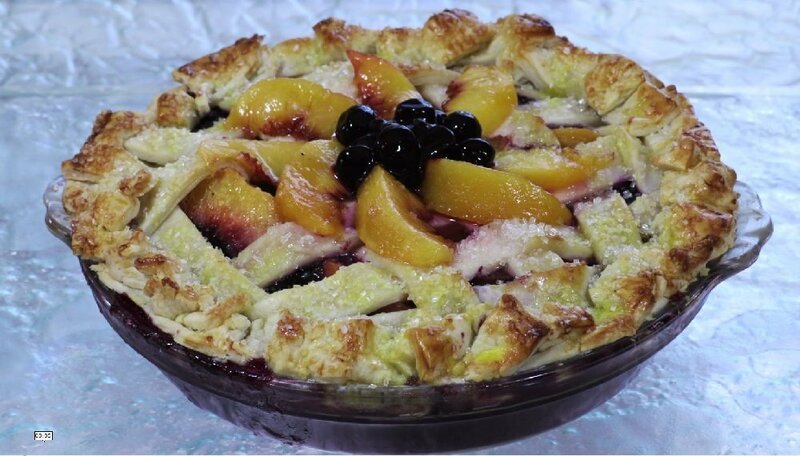 It’s the end of the season for fresh Arizona peaches so I thought I’d share the big season finale in the form of a mouthwatering pie! This pie has double billing, though, because I’ve paired the peaches with fresh blueberries. The combination is out of this world! You can use your favorite pie crust recipe, but I’ve cheated with a store bought crust and gave you some tips on making it taste homemade, like pre-baking the bottom shell with a little sugar! If building a lattice crust has been a pesky task for you, I’ve also included the best ever guide for making lattice topping easy and foolproof! For a glossy finish, brush egg-wash over top and sprinkle with decorative sugar. Bake for about 25 minutes or until dough on top is golden brown. I used the leftover dough to make a dough border around the pie. I will buy an extra pie shell to use as a border around the pie.